Check out the story about my retinal condition in the March 2013 issue of Prevention. The magazine does not allow non-subscribers to access the articles, but if you happen to be in the grocery check-out line, you can read about many of the eye problems that people experience as they age including the detached retina in my left eye and my subsequent treatment. If you have been following this blog for any length of time, you have read some of my posts on aging eyes (see below). I wrote these not because I wanted to share my problems — I am actually somewhat shy about doing that — but because eye problems are often a part of aging, and we all need to know what to do about them, whether for ourselves or our elder parents. Floaters and flashes may indicate an emergency eye condition. Furthermore, cataracts can develop naturally or they can be the result of other eye surgery. Something else important to note is that people who develop cataracts do not need to wait until they are debilitating. Ignoring these problems may only make them worse and make a person far more uncomfortable. My eye journey of nearly five years has included monitoring, treatments, and surgeries by three amazing surgeons, Drs. Kanifar, Deegan, and Gaspar, who returned my vision to a quality that I cannot remember since I started wearing glasses when I was five years old and contacts when I was twelve. A steady stream of eye problems — floaters, in both eyes, then a tear in my right, then more floaters in both eyes, a left detached retina and vitrectomy, and the resulting left cataract side effect after the vitrectomy. When the surgery returned my left eye to almost perfect 20-20 vision, my right eye continued to get worse. My right retina never actually detached, but more and more large floaters decreased my vision and made it impossible to drive at dawn, dusk, and at night. Moreover, with one really good eye and one really terrible eye, I could not be fitted for glasses — everything we tried gave me double vision. So last month I had surgery on my right eye to get rid of the intrusive floaters and a small cataract. The two surgeons preformed their procedures together. Now four weeks out, I have really good distance vision, wear reading glasses, and continue to several times a day to wonder, just a bit, if something else might go wrong. My last surgical follow-up appointments are about six weeks from now. Most of the time I am optimistic that my recovery will continue. Read my other posts about being a detached retina patient. I had laser surgery to repair a retinal hole last week and have been freaking out about future retinal problems since then. What is that was the beginning of me always having eye problems?!? Your situation of requiring multiple repairs on the same eye is pretty rare, correct? I’m so scared. I’m only 38. 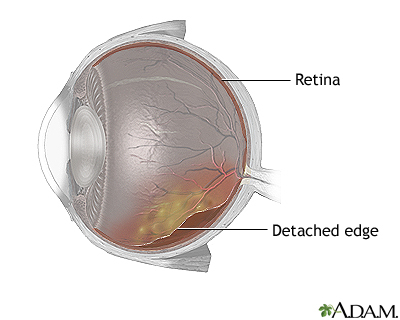 My condition, PVR, is a rare condition in which retina detachments occur over and over again. Only a few people experience the complications that I’ve described in several of my posts. My recommendation is that you follow your doctor’s orders to the letter. Confirm and reconfirm when you can become really active and then perhaps wait a while longer. If you are nervous, ask the doctor if you can schedule follow-up a bit more often so you are reassured. I enjoyed reading your posts about your retina problems because I have had similar problems. In 2010 I had 2 unsuccessful surgeries to repair a detached retina in my left eye. The third, a vitrectomy, was successful but I developed a cataract because of it. I had cataract surgery, but my vision is still only 20/80 on a good day in that eye. Now, 6 years later at an annual follow up, my retina dr saw a small hole in my right retina that he layered around. I now live in constant fear of something happening to my “good eye”. I am only 34 years old. I wish I had a quick answer, but I do not. You sound like a trooper, and as long as you keep in touch with your physician anytime you think you observe a symptom, you should keep on top of the situation. I always check if I have any concern, not waiting around. I will say that I no longer live in fear about something happening to my good eye. I still have some floaters, and I know what symptoms to watch for, but I’ve tried just to get on with life, even though my eyes are never far from my mind. I always wear my glasses or sunglasses to be sure my good eye is always protected, and most of the time I don’t think about it. We’ve made a few accommodations around the house about it. As far as my surgeon is concerned, he’s great, and several times he’s suggested that I go longer than six months before seeing him again. I’ve kept the check-ups, for now, at six months, and he’s fine with that. « Why is Hospice Still A Tough Call–Even for People Who Know?